Members are trained and assessed in how to deal with hazards, operate safely as a member of a team, communicate with others, perform administrative functions, and generally become a functional member of their SES team. Members are trained in search techniques to locate lost persons and/or items as a member of a land search team. 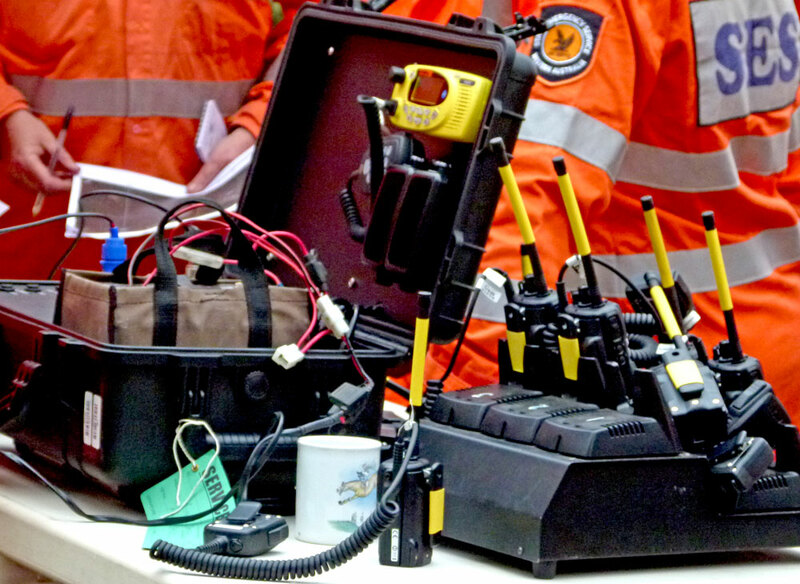 Members learn how to transmit and receive transmissions in routine and operational situations using the organisation's communication systems and equipment. Members are trained to handle emergency situations using life-saving techniques and learn skills to safely evacuate a casualty. Members are trained in map reading skills and the use of a compass to enable them to plot positions on a map to determine current location and destination. The State Emergency Service requires all members to attend courses which will enable the member to perform all necessary tasks which they are called upon to do. Training sessions are held on a Wednesday night (second Wednesday of the month) commencing at 7.00 pm and one day (usually the 4th Saturday of the month) at venues nominated by the Training Group. The day sessions will be at times nominated by the Training Group – which could be anywhere between 6.00 am and 5.00 pm. Training courses are run throughout the year. 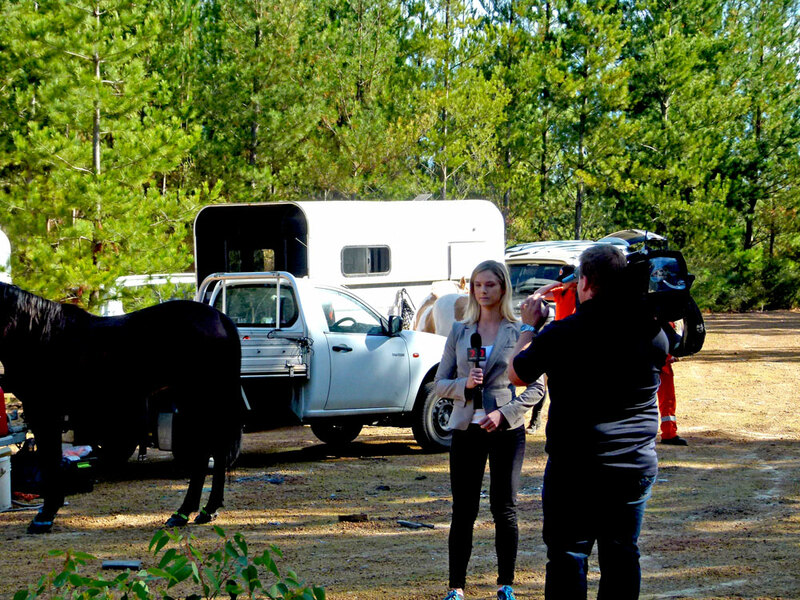 So you want to be a mounted search team member? Well what exactly does that mean? 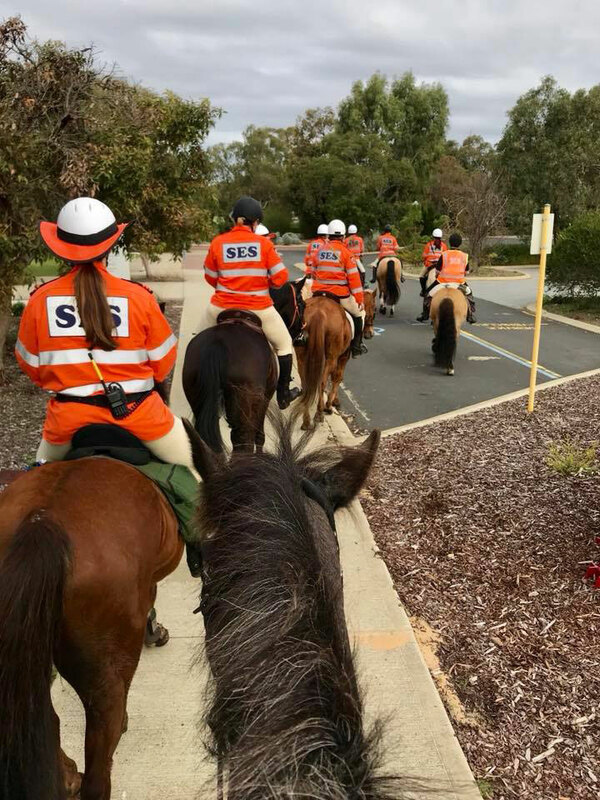 From a mounted member who has been in the Unit since its conception, it means a whole range of things – it means ‘serving your community’, and what better way to do it than from the back of your horse. It means ‘taking on a commitment’ but that commitment is made easy and enjoyable because you are committing your time with like-minded people, and the horsey fraternity do gather together like a herd. It means ‘making a lot of friendships’. You cannot help that with the wonderful group of people who join the Unit, and we bond probably more strongly because of the work we do and knowing the sort of things we are likely to encounter in our role of searcher, so we support each other wholeheartedly, and we enjoy our horses and riding without the need to be competitive. It means ‘having fun’. Although the role we take on is one of vital importance (I mean, it’s not every day you get called out to go and save someone’s life, which in effect is exactly what we do) being a mounted member can bring many unforgettable memories and experiences that you most likely wouldn’t get elsewhere. You will be given opportunities that would probably not come your way in the normal course of your equestrian life. Mounted parades through Perth. (When else would you get to ride through Hay Street mall). Musical displays (I can hear the groans from those who have participated already). Some of us were around when we worked with the Kings Troop Royal Horse Artillery training horses for gun carriage work and jousting for the Perth International Tattoo. And every search you go on looking for some poor unfortunate soul who needs assistance, for whatever reason they went missing, you will remember that quiet feeling of having contributed, of having given something of yourself, particularly to the distraught families who wait with bated breath for news of their loved one … you will know you were a part of that effort to bring them home. 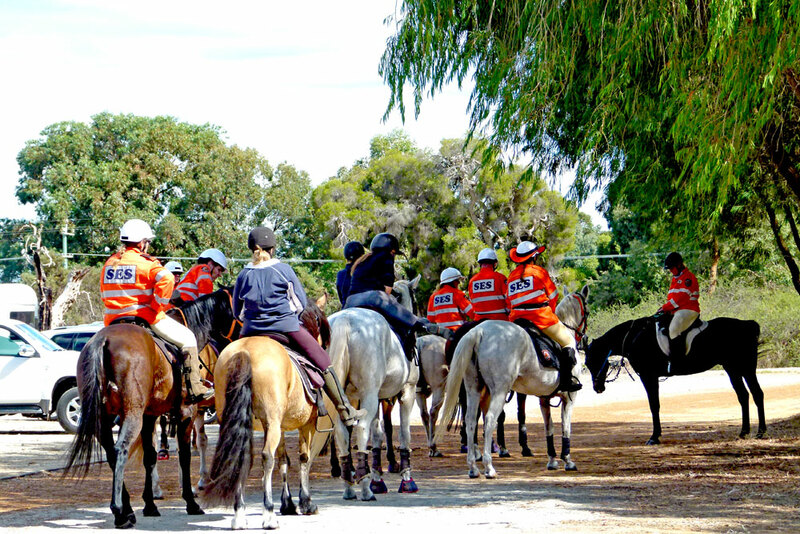 So what do you need to be to be a mounted member? Well, a little of it is explained above. You need to be a team player because we do not search in isolation, we search with our friends as a trained team. You therefore need to be committed to attending the training that is provided to you – free of charge, except for your time – some of which is nationally recognised and can carry through to your workplace. You need to be willing to put yourself out at times, to cancel out of some family gatherings at short notice, to take a turn at helping with the training rather than ride and, when trained, to step up to the plate and commit to training others. You need to be able to laugh in the face of adversity. It helps when the job becomes very serious and maybe slightly unpleasant. And no, we really don’t have a warped sense of humour – it is just one way of coping. You need to be able to follow orders because this is the way the job gets done expediently – you can discuss your concerns or differences with the Team Leader or Management afterwards if you feel there is a better way. And you need to be a good horseman/horsewoman, rider and groom, proficient enough to turn your horse out in a healthy and sound condition (it’s nice if the public go Ooooh!) with your gear clean and in good order, your uniform the same so that the Unit image is maintained, and you need to have that commitment that you tend your horse before you tend yourself, regardless how tired you are or how long a day we have had. And you need to have a high regard for safety and an understanding of courteous riding for the safety of the whole team. These things are the foundation of a good Mounted Section member. These are the things that have enabled us to operate for over twenty years in harmony and without major injury. So what about the Mounted search horse? Ah, well that is another article. As a new intake joins the Unit, I know every member of the Unit wishes you success in your probationary period and will make you feel welcome. If you have any questions, just ask and I know someone will help you.